For the best part of a decade, TERROIR wereinvolved in various roles including the Retail Fitout Management for the Queen Victoria Building undertaking Design Reviews of proposed fitouts as part of a more complex management structure. TERROIR's experience with heritage issues was a continuing factor in the successful transformation of the centre from 2000. 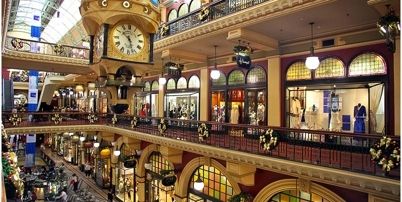 Over five levels, the Queen Victoria Building houses Sydney's contemporary fashion, food, art, jewellery and antiques amidst the backdrop of Romanesque design. In all retail commissions TERROIR has integrated Retail Design Reviews and Tenancy Coordination into a highly synthesised "one stop" form of service appropriate to the individual requirements of the building being addressed.